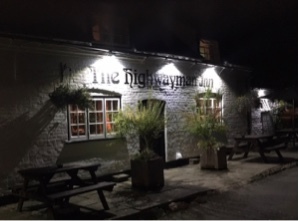 My cousin Paul and Em joined us the other evening for dinner at The Highwayman in Exlade Street - a tiny village not far away. Here's the view as we left. For the past few weeks I've been spending many hours every day painting an oil for submission to next year's BP Portrait of the Year competition at the National Portrait Gallery in London. It's of my nephew Daren (as he was nearly 40 years ago). 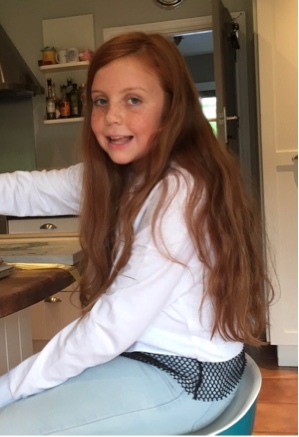 But as torn jeans seem to be the fashion right now maybe I'm right up-to-date. The painting is quite large - 35 inches high - and here is the progress so far. I'll be starting on his hands tomorrow, and will get to the face the following week with maybe a few strands of green in his hair. (I remember he went through a few phases of colour in those days). 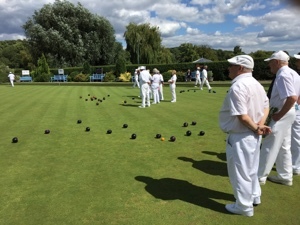 Now that my knee is on the mend I'm more active on the bowling green these days (until the end of October when I'm scheduled for an operation to have a hip replacement!) so it was great to play against a number of teams from London recently. The Henley Bowling Club is right next to the river so visiting teams always look forward to coming here. 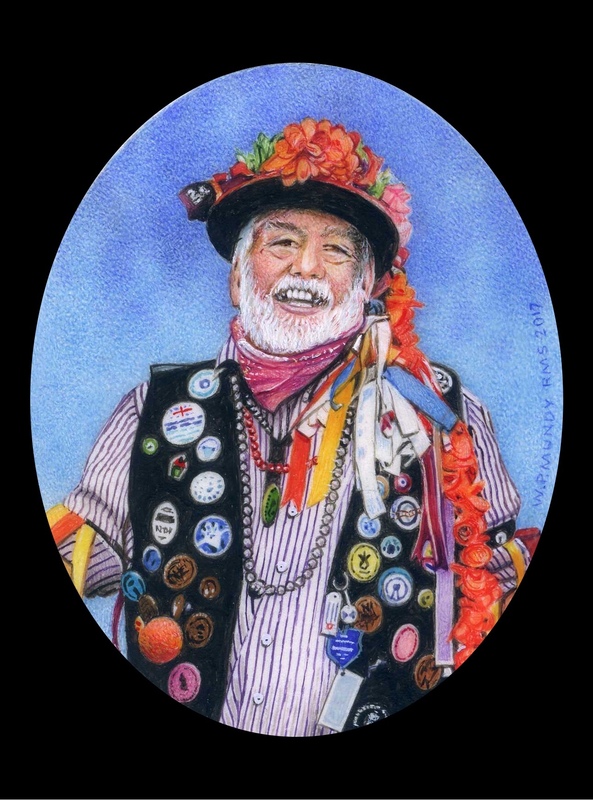 While waiting for part of my punk rocker painting to dry before I could continue I managed to paint this minature of the Morris Dancer I mentioned we saw one evening in Henley recently. As I will be sending off my five entries to Florida next week for their annual miniature show I think I'll include this one to show our cousins across the water what some of us get up to when we go dancing. 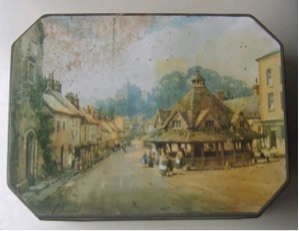 I mentioned on a previous blog that many years ago when I was an apprentice lithographic artist I painted a picture of Dunster Yarn Market in Somerset for the lid of a Huntley and Palmers biscuit tin. 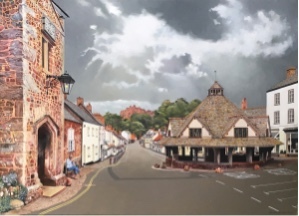 So when my young friend and I were in Dunster earlier this year I took a few photographs as reference for ne to paint an up to date oil painting of the scene. Just the other day myf bought me this actual tin, on Ebay. And here is my new painting. I left out the cars and just showed a single person in the scene. 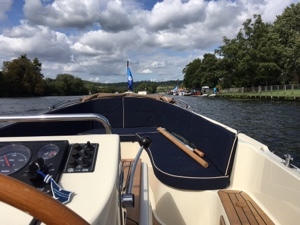 Last friday we took a trip down the river through Hambleden and Hurley locks to Temple. It was a lovely day and we took a picnic to have on the way back. The new boat has proved to be a great success. We've been out on it this summer twenty times so far. 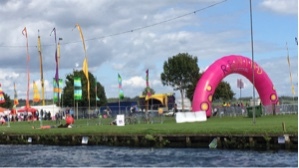 This is a view from the helm as we passed by the Rewind Festival held opposite Temple Island. 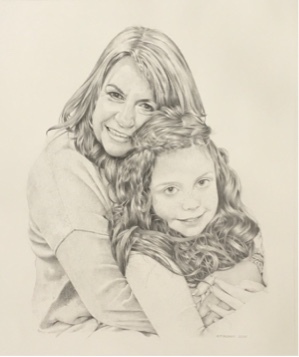 My lovely great niece Kate was eleven the other day and I popped over to Marlow to give her her birthday present - a large framed drawing I made of her and Louisa, her mother. For the past couple of months I've been persevering with my new varifocal glasses but increasingly finding them difficult to use. The optician told me that a cataract that has been stationary in my good eye for many years has now moved and is probably causing the ghost image I'm experiencing. So I had to return them. (They very kindly gave me a refund). I just hope that when, or if, I have the cataracts removed it doesn't affect my sight to the degree that I won't be able to paint miniature portraits any more. 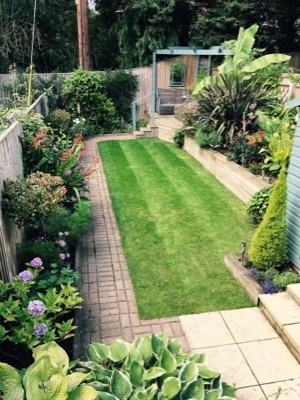 My young friend's garden is looking quite lush at the moment with her banana trees growing beautifully. (Her smaller. striped-leaf banana produced an offspring which I'm trying to rear - without much success so far - on one of my balconies). This was the view of her garden the other day. A fellow artist friend, Jim Kelso, invited me over to his house the other day to see an exhibition of his latest paintings. 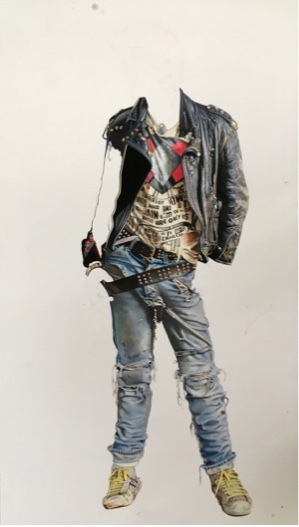 He's a really good artist - mainly paints unusual landscapes, still life and portraits in exquisite detail. We went outside, past a wishing well, to his well appointed studio at the bottom of the garden. How lovely to be able to have a couple or more easels spread around with lots of space to lay out all your paints, canvases, brushes, and other art equipment. When I win the lottery I'll buy a big house with a studio. 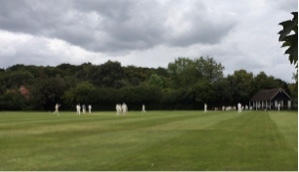 The other day, as we were driving through Greys village, we saw a cricket match in progress. The scene was so perfect, so English, that we parked the car nearby and sat on a rustic bench in the corner of the field to watch for a while.